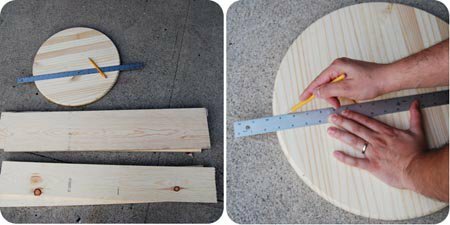 These wooden doll cradle plans are for non-woodworkers and are so simple that anyone can make a lovely rocking doll cradle this way. Using just five pieces of wood and some metal brackets you can finish up this project in no time. 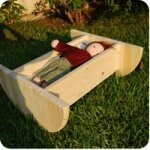 This is the cheater's guide to making a rocking wooden doll cradle, but the end result is a sturdy and natural wooden bed that will withstand hours of doll play! This cradle is ideal for a 16" doll, but you can adjust the length of the boards to suit your particular doll sizes. 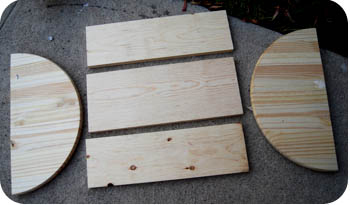 The hardest part is cutting your three boards (2 that are 6" wide and one 8" wide) all 18" in length and cutting your circle in half evenly. If you have friendly lumberyard workers I highly recommend just having them cut it all for you in the lengths you need. Then all you need to do is assemble at home! This may cost a few dollars, but is well worth it unless you are familiar with saws and have them readily available at home. Since it is pine and is very soft, you can use a handsaw or jigsaw or whatever you have available at home to cut if you don't have it cut for you. Next, attach your brackets with screws, four on the bottom and four on the inside attaching the sides. You can also tap some small wood nails to further strengthen your cradle, but this is optional. It is very helpful to have two people during this part, to help hold the cradle and keep it steady while you attach the brackets. Finally, sand all your edges until silky smooth! For sealing ideas, see the Wooden Doll Cradle Natural Wood Finishes page. A 16" long by 8" wide doll quilt fits perfectly and this bed is just the right size for dolls under 18" long. For doll making patterns here is a Simple Rag Doll Pattern and Waldorf Doll how-to instructions. Enjoy! Return to the Homemade Toys Section for more project ideas!